This week on FOX’s dance competition reality show, “So You Think You Can Dance” (SYTYCD) the contestants which were hand-selected by judges Mary Murphy, Nigel Lythgoe, and Vanessa Hudgens to go on to The Academy this week, had four chances to prove themselves as talented in all genres. The first week of the Academy, which took place at the famed Dolby Theatre in Hollywood, included choreography rounds of Hip-Hop with choreographers Napolean and Tabitha (Nappytabs), and Ballroom with Jean-Marc Généreux. Those that survive the first week, will move on to the second where they must kill it in Contemporary with SYTYCD past contestant and Emmy winning choreographer Travis Wall, and Jazz choreographed by Mandy Moore (“La La Land”). Only ten guys and ten girls will make it through to the next round to create the SYTYCD Top 20. Something the show hasn’t produced for a while. Nigel gave an opening speech to the dancers that they must prove themselves as stars. He stated that they must have that “it” factor. The dancers first had to impress the judges again with their solos. Darius Hickman was up first, and he did just that. Vanessa commented that she “loves” Darius. Jensen Arnold with up next. Her sister is Lindsay Arnold who competed on season 9 of SYTYCD. Jensen told SYTYCD host Cat Deeley that she’s ready to step-out of her sister’s shadow and be Jensen Arnold. Other solos shown came from: Dustin Payne, Rachael Blanchard, Melany Mercedez, Hannahlei Cabanilla, Jay Jay Dixonby, Magda Fialek & Allen Genkin, Emily Carr, Bridget Derville-Teer, Randorn Luangpraseuth. After the two-hour long solo round, the judges had to make their first round of selects, which also meant they’d be sending some dancers home. Seventy dancers total danced solos. Nigel called Jensen out first. He called her a little bit stronger than her sister in places. He told her she got a little “heavy” in places (whatever that meant). But, keep it up and she got sent through. When Tessa came out and danced her solo, Mary told her they felt that she is “extraordinary” and had the best solo of the entire day. Pictured: Nappytabs (far right) joined judges (l-r) Mary, Nigel, and Vanessa. Jordynn and Elan were sent home. Fifteen more contestants were also sent home including Mika Doman. Fifty-three dancers remained to enter the Hip-Hop round of choreography where they underwent the instruction of Hip-Hop choreographers Napoleon & Tabitha (Nappytabs). Nepoleon said this routine was difficult because of the slow moments followed by fast moves. Unfortunately, Zoe Zimmerman experienced an injury by the end of the 90 minute Hip-Hop round. 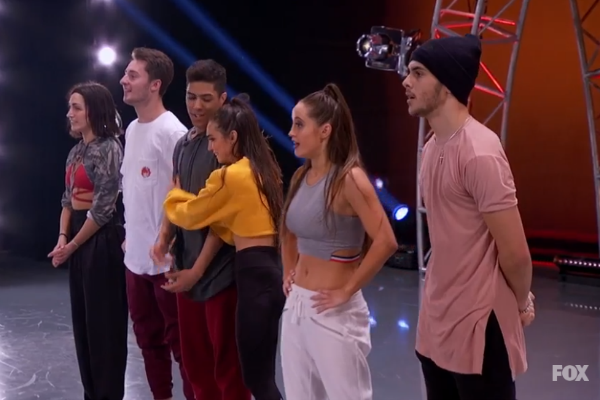 The first group of dancers to prove their hip-hop skills to the judges were mostly contemporary dancers paired-up with each other that included Alexis Gilbert & Riley Kurilko, Victoria Neukom & Tyrese Parker, and Sydney Moss with tap dancer Evan DeBenedetto. In the second group, animator Ryan Green was paired with Emily Carr. Krumper Samantha Reyes was paired with Ballroom dancer Cole Mills. Though Ryan had difficulty with the moves, he was given a second chance. Samantha was sent home after not being able to keep count on the moves. The fact that Ryan made it through and she didn’t was probably some fuel to her angry outrage she displayed later in this episode. Ballroom dancer Cole Mills impressed the judges and shocked them with his Hip-Hop ability. Some of the B-Boy hip-hop dancers, such as Randorn and Slavik, had a hard time picking-up the Nappytabs choreography. However, the judges decided to save them for another round and pushed them through. Injured Zoe Zimmerman danced in the second group. She didn’t do well and the judges gave her, along with Tessa who also was in the same group, another chance and moved them to the next round. Tapper Eddie Hoyt was in the last group of dancers for the Hip Hop round. He kept his happy go-lucky persona all throughout his choreography of a heavy rap beat which didn’t exactly work. Nigel and Neopleon explained it to him, then pushed him through to the next round. Ballroom round was next. But, before that, Zoe Zimmerman who is a ballroom dancer, said goodbye to the judges and SYTYCD after returning back from Urgent Care. The first Ballroom group included animator Kyle Bennett Jr. who was paired with Genessy Castillo; Allen Genkin & Rebecca Troyak; Tyrese Parker & Stephanie Sosa. Stand-outs for completely different reasons were Kyle and Genessy. Kyle’s lack of Ballroom experience was apparent and Genessy was so good that the judges told her she just entered their radars. They all advanced to the next round. The second group of Ballroom included Jensen who was paired with B-Boy Gaevin Barnacles. Salsa dancer Melany Mercedez was partnered with animator Ryan Green. Ryan was sent home after the judges explained that it didn’t work for them. He admitted that he’d never danced with a partner let alone ballroom. Jensen and Gaevin both moved forward. In the final group was Ballroom dancer Stephanie & contemporary partner Darius, Jazz dancers Rachael Blanchard and Jay Jackson were paired together. Jay, who danced all the rounds dressed in drag, showed-off a new look, his “masculine side.” He came out as himself he said to show that he’s versatile. Nigel had Jay switch partners to dance again this time with Stephanie. Rachael was let go. Nigel talked to Jay and said he wasn’t happy with Jay being there, but he’s changing his mind and said Jay is proving that he’s a dancer with guts. He told him that he’d be joining Stephanie and Darius to move on to the next round. Jay was estatic and relieved. A total of 41 dancers moved on to the next round of choreography. That is Contemporary where they’ll work with choreographer Travis Wall. If they make it past that round, they’ll face the Jazz choreography round with Mandy Moore (“La La Land”). Only 20 dancers will remain by the end of next week’s episode. 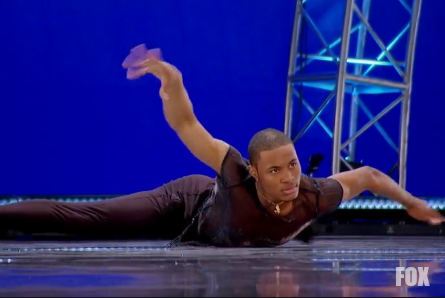 “So You Think You Can Dance” airs Mondays at 8pm PT on FOX.